edit by Admin 23/7/2015: added picture. So the new Jazz is a bit bigger but lighter, more comfortable and refined and a bit quicker but more economical, it all sounds good. No mention of the hybrid version which allegedly adds 33 bhp to the power but that wasn't a Honda review. There's a lot that I like the look of: Improved ride quality is one attraction while the overall fuel economy of the CVT version appears to be close to my current Jazz hybrid (less good on urban but better on extra urban) and there should be somewhere to keep the spare wheel (which the hybrid lacks). I will need to get in this car on a sunny day to see if it has reduced the problem of glare from the front fascia reflecting on the windscreen. Reading about the new CVT hasn,t it gone full circle. I seem to remember that you could drive the GD CVT in 7 speed mode when in D.
Silly point, but why us PS instead of bhp, they work out almost the same and bhp is British! An all-new CVT control logic was developed specifically for European markets to deliver the direct and linear feeling expected of a manual transmission. This results in vehicle speed matching accelerator pedal position more closely for a more direct feel, while engine speed increases proportionately to accelerator pedal position for a more linear feel. One of the oft made criticisms of the CVT by testers is the way the revs rise then the speed catches up to them, they don't bother to find out how a CVT works. This innovation by Honda sounds like an attempt to alleviate that. Interestingly Subaru use a CVT and it's software makes it perform like a multi speed automatic. Speaking to a salesman at my Honda dealer he said the CVT has not changed !!! Innovation? Innovation my backside! It's a regression! As for salesman, they don't half talk some rot! 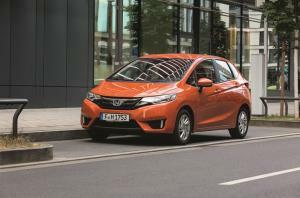 There's photos of the new Jazz on Honda UK's offer page http://www.honda.co.uk/cars/new/jazz-2013/offers.html. However, all the links on that page still lead to the old model. Perhaps Honda UK are slowly editing their website before announcing the availability. My local sales rep tells me that the new Jazz is not available with a sunroof/glass panel, even on the EX model. Surely this can't be right, if it is, then my current EX will be the last! All my cars from as far back as i can remember have had a sunroof and i'm not about to change now. So you'll have to buy the HRV. The one I briefly sat in yesterday had a glass panel in the roof.